Jan Schakowsky, 71, U.S. Representative, for being a leading advocate on issues of importance to the LGBT communities, focused on creating change that brings about equality and justice. Janice “Jan” Schakowsky was born in Chicago on May 26, 1944, and grew up in Rogers Park. She graduated from the University of Illinois in 1965 with a Bachelor’s degree in elementary education and then taught for two years in the Head Start program. In 1969 she founded National Consumers Unite, a consumer-advocacy group that led a campaign to imprint freshness dates on food packaging in stores. From 1976 to 1985 she was a director of the Illinois Public Action Council, another consumer-advocacy organization; from 1985 to 1990 she served as executive director of the Illinois State Council of Senior Citizens. 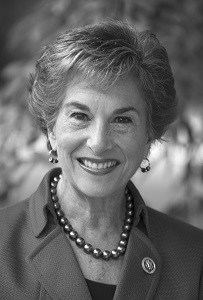 From 1990 to 1998, Schakowsky served in the Illinois State House of Representatives. When Representative Sidney Yates announced his retirement in 1998, she won both the primary and general elections, and since then has served in the House as the Representative from Illinois’s 9th Congressional District. Currently in her ninth term, she is a member of the House Democratic leadership, serving as a Chief Deputy Whip and a member of the Steering and Policy Committee. She is a member of the Energy and Commerce Committee, where she is the Ranking Democrat on the Commerce, Manufacturing and Trade Subcommittee. For decades, Schakowsky identified her top priority as winning affordable, quality health care for all Americans. In 2009 and 2010, she played a leadership role in writing and passing the historic Patient Protection and Affordable Care Act that finally established health care as a right and not a privilege in the United States. She is proudly pro-choice, favors marriage equality, and supports comprehensive immigration reform. Jan Schakowsky has never had to “evolve” on LGBT issues, for she has always stood on the right side of history. She has been a leading advocate on issues of importance to Chicago’s LGBT communities throughout her entire career. From her early years as a community activist to her tenure as a state representative and her nine terms in the House of Representatives, Schakowsky has been focused on creating the changes that bring about justice and equality. What makes her such an effective legislator is that she understands the intersections by which every issue on the national agenda—from marriage equality to employment non-discrimination and from immigration reform to homelessness—uniquely impacts LGBT individuals and their communities. It would be difficult to find a closer friend and ally to Chicago’s LGBT communities than Representative Jan Schakowsky.